From Aravind Adiga, the bestselling, Booker Prize–winning author of The White Tiger, a dazzling new novel about two brothers in a Mumbai slum who are raised by their obsessive father to become cricket stars, and whose coming of age threatens their relationship, future, and sense of themselves. Filled with unforgettable characters from across India’s social strata—the old scout everyone calls Tommy Sir; Anand Mehta, the big-dreaming investor; Sofia, a wealthy, beautiful girl and the boys’ biggest fan—this book combines the best of The Art of Fielding and Slumdog Millionaire for a compulsive, moving story of adolescence and ambition, fathers, sons, and brothers. 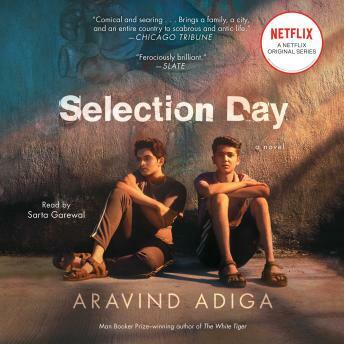 Selection Day is Adiga’s most absorbing, big-hearted novel to date, and proves why “with his gripping, amusing glimpse into the contradictions and perils of modern India, Aravind Adiga has cemented his reputation as the preeminent chronicler of his country’s messy present” (Newsweek).